Is Theresa May a Robot? Whatever it be, Theresa May’s admission that she used to naughtily enjoy running through wheat fields or her sinister and quite frankly evil laugh that once resembled Skeletor from ‘He-Man: Masters of The Universe’, Theresa May has had a lot of accusations thrown her way already. The most recent accusation being, is she even human? Could she be a robot? 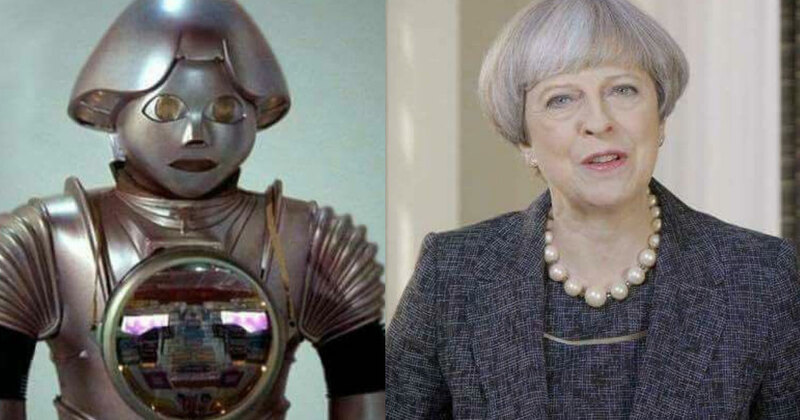 Mrs. May was accused of being “robotic” during the 2017 British General Election campaign, with some even speculating if she was cybernetic, programmed to repeat her monotone catchphrase “strong and stable” while somewhat resembling fellow machine turned politician Arnold Schwarzenegger’s iconic sound bite “I’ll be back”. But alas, it seems Theresa May has set the record straight. She really isn’t a robot after all – she said it herself. Talking about the election campaign to the BBC, she revealed how she would have liked to have met more voters during the campaign. Indeed, the only thing “iron” about Mrs. May is the iron she takes along with her daily vitamins every morning before she leaves 10 Downing Street. So there you have it, the British Prime Minster is not part of the extra-terrestrial race of Daleks or even a Terminator disguised as a human. But Jeremy Corbyn on the other hand, we cannot confirm or deny whether he is in fact an android from the year 2029 sent here to exterminate the British public and common sense as we know it. We will keep you posted when judgement day dawns upon us and hordes of mechanical illegal migrants invade our shores and insert their greasy nuts and bolts into innocent British civilians, quite literally! Don’t say that Brainstain don’t help you when it comes to national catastrophic robotic disasters.